Mississippi casinos and hotels attract guests from around the world. Visitors to the Mississippi Gulf Coast sometimes discover that good people end up at the wrong place at the wrong time. When an arrest happens, some guests mistakenly believe that they can simply leave and return home to forget the legal consequences. If you or a loved one has been arrested in a Mississippi Gulf Coast casino or hotel, you should immediately contact a Mississippi Gulf Coast defense lawyer. Thinking “what goes on the road stays on the road” is not a strategy. A casino arrest can shadow you home and linger. Gulfport defense attorney Rufus Alldredge was the assistant district attorney in Biloxi, Mississippi when casino gaming was legalized. Back then, the first Mississippi Gulf Coast casinos were on small boats. Some of the boats left the dock for a cruise, and others remained at the dock. 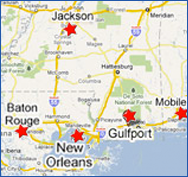 Gaming laws and regulations were initially enforced by the Mississippi Highway Patrol. Over the last 25 years, Mississippi Gulf Coast casinos have become bigger and permanent. The legislature created the Mississippi Gaming Commission to enforce gaming laws and draft regulations. After Hurricane Katrina destroyed the casino boats in 2005, Mississippi law adapted to allow casinos to rebuild onshore. Sliding. This means prearranging dice to your numeric values and sliding them down the table. Bet capping or past posting. This means making a bet after the outcome of the game is known. Marked decks. This means altering top of a card so the player can tell what the card value is. False shuffles. This is when a cheating dealer pretends to shuffle the deck in a random manner without doing so. False dealing. This means giving or withholding known cards to a player. Monkey paw. This is a flexible rod with a claw to hold open the slot machine payout chute. Underage gambling. The legal age to gamble is 21. Mississippi Gaming Commission and local police departments are authorized to make arrests. Gambling with a minor. Helping a minor violate the gaming laws or conspiring to do so is illegal in Mississippi. Using fake I.D. to enter casino nightclub. This is not a gaming violation per se but takes place on casino property. This is generally enforced by local police. Reentry after a no trespass notice or self ban from casino. This is a form of trespass enforceable by the Mississippi Gaming Commission or local law enforcement. Casino patrons should be aware that being arrested in a casino usually means being banned. Any reentry can be charged with trespass. When a person is charged with violating the Mississippi Gaming Control Act, or regulations, the case file is forwarded to the district attorney for grand jury presentation. The best Mississippi defense attorneys know how to advocate at the district attorney’s office. The grand jury is authorized to consider and indict alternative charges, including common law offenses. For example, if a casino guest is charged with stealing cheques (chips), the grand jury could bring an indictment for a common law charge such as grand larceny. The Mississippi Gaming Commission regulations mandate surveillance camera coverage on all gaming floors. Casino video is supposed to promote safety and security. Professional gamblers are aware that if they win big, the cameras watch them more closely. Other security measures can include sensors tracking a patron’s movement across the gaming floor. Casino dealers, pit bosses, and staff are trained to detect cheating and other violations of law by casino patrons as well as employees. Larger casinos may employ additional measures such as license plate readers in the garage and biometric face recognition. Defenses are always fact specific to each case. Defenses can include lack of evidence, lack of intent, innocent mistake, mistaken identity, or alibi. We defend tourists, out of state visitors, and local residents including casino employees. If you have been arrested in a casino or hotel, or charged with a Mississippi gaming violation, call us. We can help you separate the issues to achieve your best outcome. Contact Gulfport defense lawyer Rufus Alldredge at 228.863.0123. We are located at 1921 22nd Avenue in Gulfport, Mississippi.